Get this credit card reader FREE with signup and a 2.69% rate for Swiped Qualified Credit Cards with our MobilePhoneSwiper Credit Card Processing System for iOS, iPhones, Androids and Tablets. Apply Today! FREE Reader W/Signup - Learn More Below! Only 2.69% for Qualified Swiped Transactions! Better Card Reader, Rates and Program than Square, PayPal Here, Intuit Go Payment and more! Works on iPhones, iPads, iPod Touch, Tablets, Androids and even Blackberry Devices! Want a PayPal Smartphone / Tablet Credit Card Reader? Click Here! Want to process credit cards on a computer? Click Here! 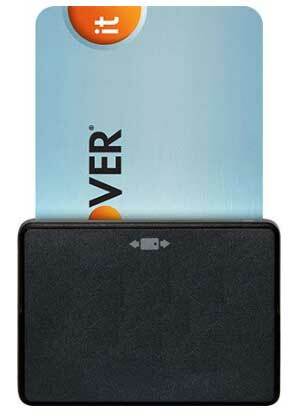 TO GET THIS CARD READER FOR FREE PLUS NO SHIPPING - CLICK HERE! For U.S. Businesses, our MobilePhoneSwiper.com Credit Card Reader and credit card processing is a simple, easy and cost effective way to take credit cards for your business! If you want the best credit card reader for an iOS, iphone or Android then you have found it right here! 24 x 7 Live Customer Support! Approval typically in only 4 minutes!! Apply now, start taking credit cards today! For a low-cost, simple point of sale system, I recently started using USBSwiper. It's good for remote events where you need clean printed invoices, SKU tracking and fast (swipe-able) credit card transactions that seamlessly interface with your PayPal Payments Pro or PayFlow Pro account. There are many positive things we could say about USBSwiper. I think the primary one is that it is a very clean and easy way to integrate a PayPal account with a physical store location and is the ideal transitional tool for online merchants who find themselves wanting or needing to sell offline. We roast and package premium coffees and sell them online, in our brick and mortar store, and wholesale through about 75 grocery stores in the Midwest.